TRIPS - SECTION 7: PROTECTION OF UNDISCLOSED INFORMATION Article 39. 1 1. 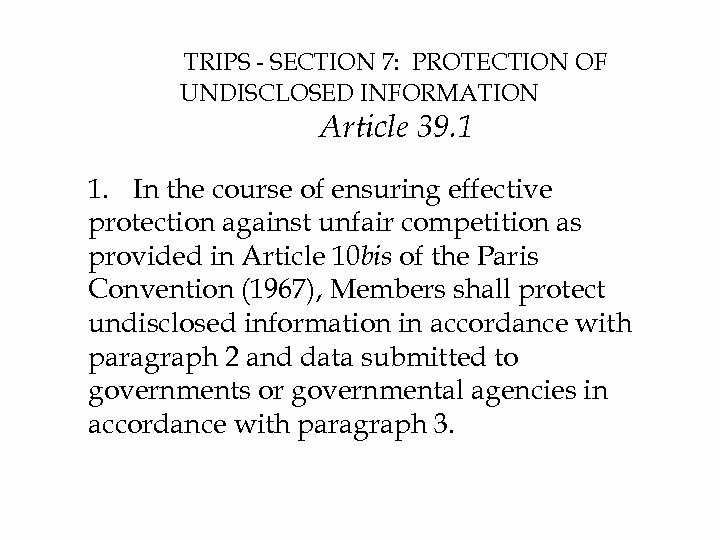 In the course of ensuring effective protection against unfair competition as provided in Article 10 bis of the Paris Convention (1967), Members shall protect undisclosed information in accordance with paragraph 2 and data submitted to governments or governmental agencies in accordance with paragraph 3. TRIPS: Article 39. 2 2. Natural and legal persons shall have the possibility of preventing information lawfully within their control from being disclosed to, acquired by, or used by others without their consent in a manner contrary to honest commercial practices so long as such information: • (a) is secret in the sense that it is not, as a body or in the precise configuration and assembly of its components, generally known among or readily accessible to persons within the circles that normally deal with the kind of information in question; • (b) has commercial value because it is secret; and • (c) has been subject to reasonable steps under the circumstances, by the person lawfully in control of the information, to keep it secret. --- For the purpose of this provision, "a manner contrary to honest commercial practices" shall mean at least practices such as breach of contract, breach of confidence and inducement to breach, and includes the acquisition of undisclosed information by third parties who knew, or were grossly negligent in failing to know, that such practices were involved in the acquisition. TRIPS: Article 39. 3 3. 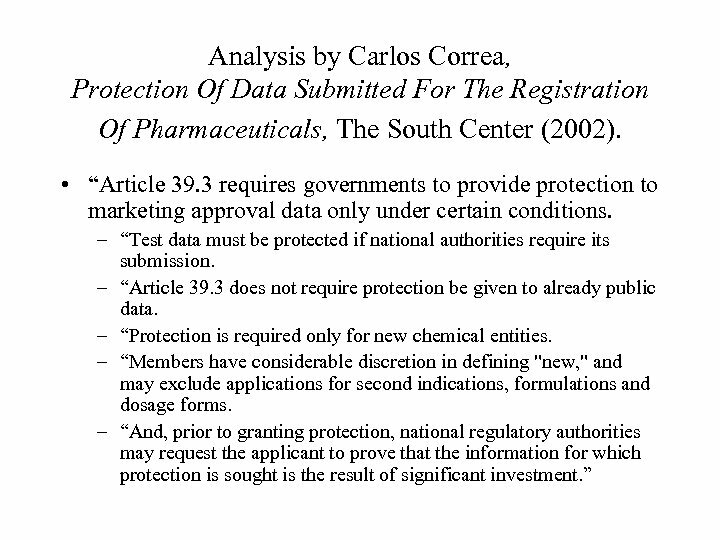 Members, when requiring, as a condition of approving the marketing of pharmaceutical or of agricultural chemical products which utilize new chemical entities, the submission of undisclosed test or other data, the origination of which involves a considerable effort, shall protect such data against unfair commercial use. In addition, Members shall protect such data against disclosure, except where necessary to protect the public, or unless steps are taken to ensure that the data are protected against unfair commercial use. 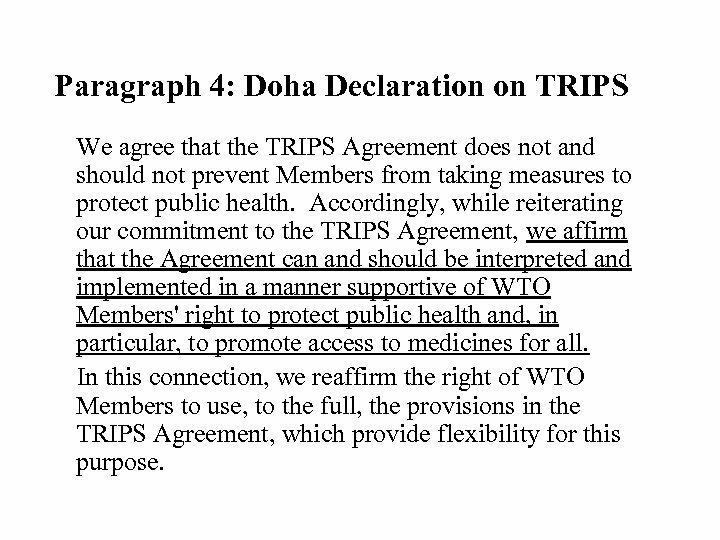 Paragraph 4: Doha Declaration on TRIPS We agree that the TRIPS Agreement does not and should not prevent Members from taking measures to protect public health. 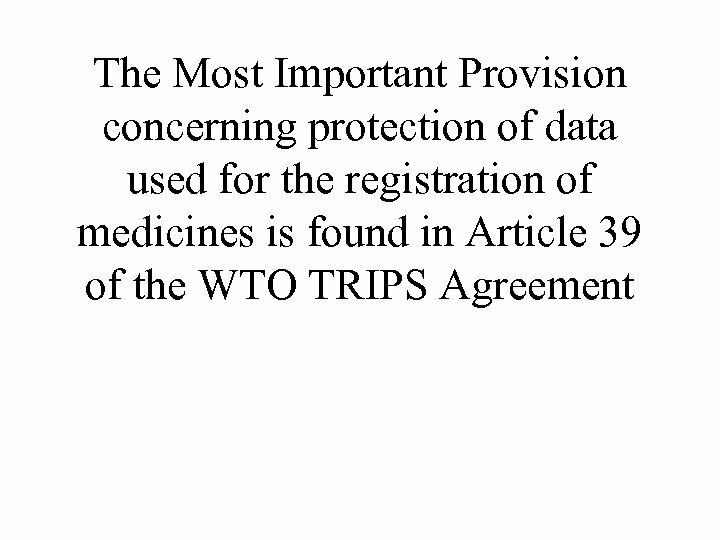 Accordingly, while reiterating our commitment to the TRIPS Agreement, we affirm that the Agreement can and should be interpreted and implemented in a manner supportive of WTO Members' right to protect public health and, in particular, to promote access to medicines for all. 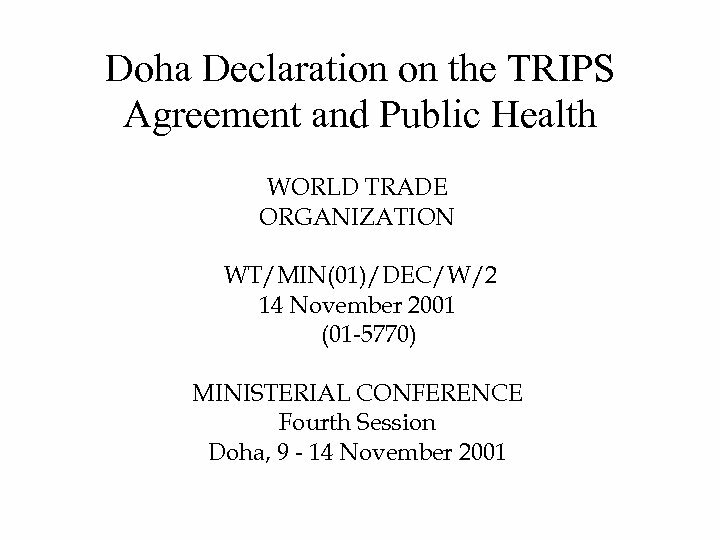 In this connection, we reaffirm the right of WTO Members to use, to the full, the provisions in the TRIPS Agreement, which provide flexibility for this purpose. What does Article 39 actually require? Analysis by Carlos Correa, con’t • Article 39. 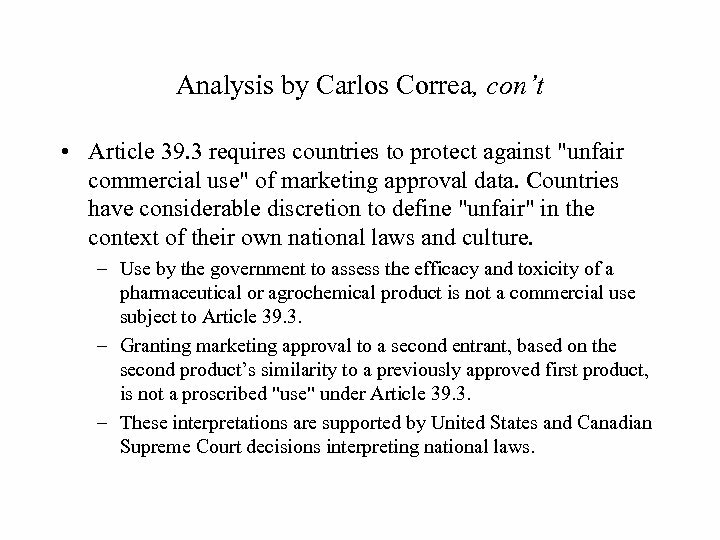 3 requires countries to protect against "unfair commercial use" of marketing approval data. Countries have considerable discretion to define "unfair" in the context of their own national laws and culture. – Use by the government to assess the efficacy and toxicity of a pharmaceutical or agrochemical product is not a commercial use subject to Article 39. 3. – Granting marketing approval to a second entrant, based on the second product’s similarity to a previously approved first product, is not a proscribed "use" under Article 39. 3. – These interpretations are supported by United States and Canadian Supreme Court decisions interpreting national laws. “The negotiating history of Article 39. 3 reveals that the parties considered at length, but did not adopt, text which clearly required exclusivity for test data. “It can be argued that if the intention had been to have such exclusive marketing rights, this term, which is used in Article 70. 9 of TRIPS, would have been used here too. 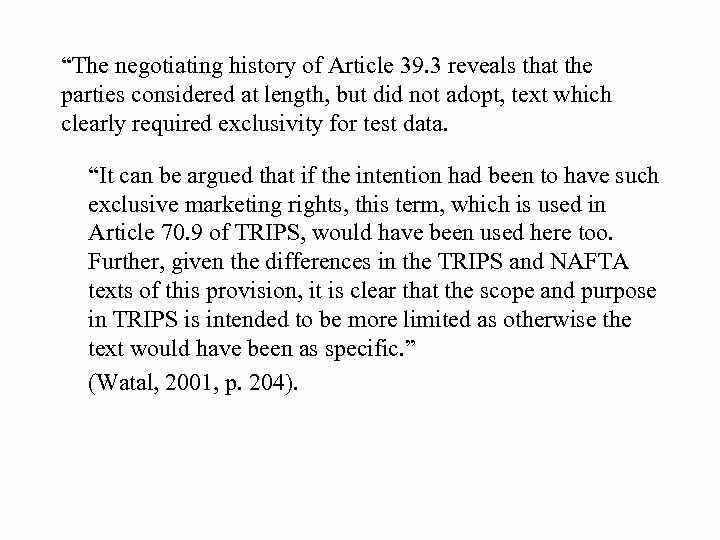 Further, given the differences in the TRIPS and NAFTA texts of this provision, it is clear that the scope and purpose in TRIPS is intended to be more limited as otherwise the text would have been as specific. ” (Watal, 2001, p. 204). 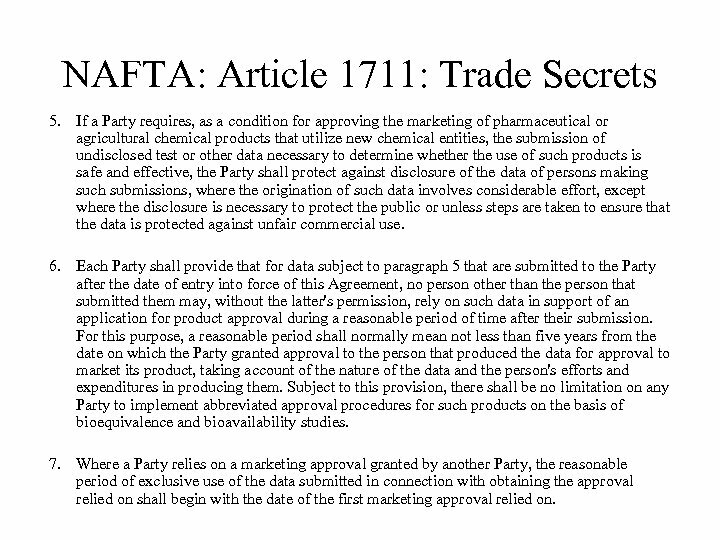 NAFTA: Article 1711: Trade Secrets 5. 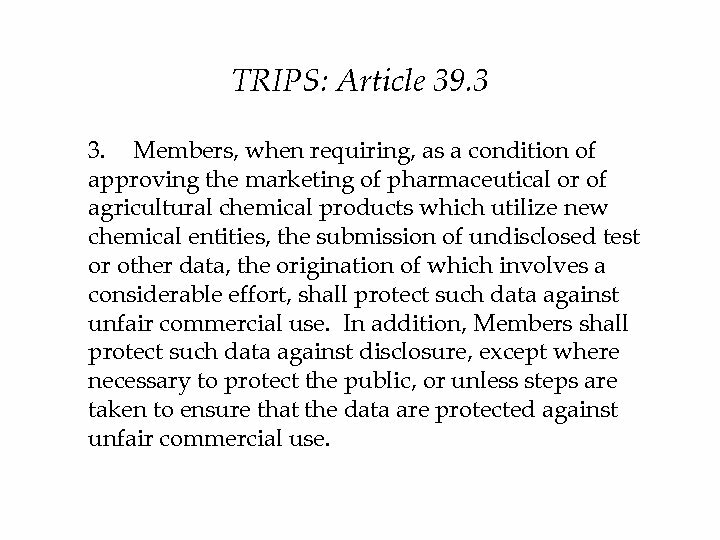 If a Party requires, as a condition for approving the marketing of pharmaceutical or agricultural chemical products that utilize new chemical entities, the submission of undisclosed test or other data necessary to determine whether the use of such products is safe and effective, the Party shall protect against disclosure of the data of persons making such submissions, where the origination of such data involves considerable effort, except where the disclosure is necessary to protect the public or unless steps are taken to ensure that the data is protected against unfair commercial use. 6. Each Party shall provide that for data subject to paragraph 5 that are submitted to the Party after the date of entry into force of this Agreement, no person other than the person that submitted them may, without the latter's permission, rely on such data in support of an application for product approval during a reasonable period of time after their submission. For this purpose, a reasonable period shall normally mean not less than five years from the date on which the Party granted approval to the person that produced the data for approval to market its product, taking account of the nature of the data and the person's efforts and expenditures in producing them. Subject to this provision, there shall be no limitation on any Party to implement abbreviated approval procedures for such products on the basis of bioequivalence and bioavailability studies. 7. Where a Party relies on a marketing approval granted by another Party, the reasonable period of exclusive use of the data submitted in connection with obtaining the approval relied on shall begin with the date of the first marketing approval relied on. Summary: what 39. 3 does *not* require • No requirement to protect data not submitted to a government agency. – No prohibition upon reliance of foreign regulatory decisions • No requirement to extend protections to second indications, formulations and dosage forms. • No requirement for exclusive rights. 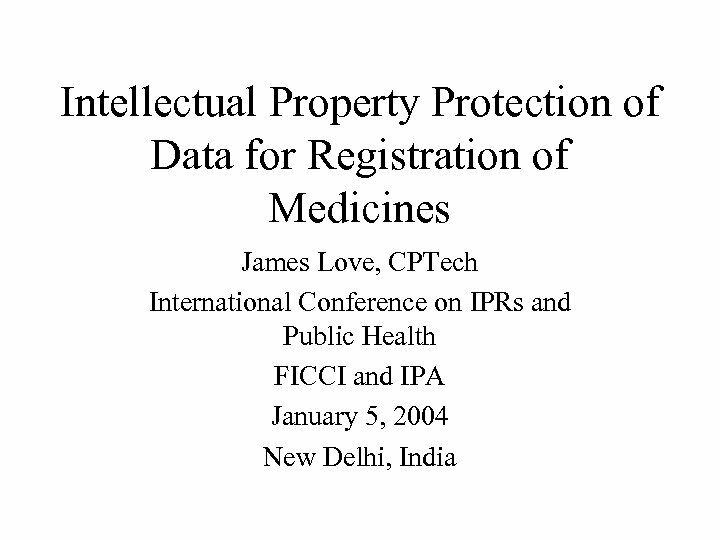 US and EC protections of data for registration of pharmaceuticals exceed TRIPS requirements • In 1984, the US 5 years of exclusive rights to data used to register pharmaceutical NCEs, and 3 years for some other uses. 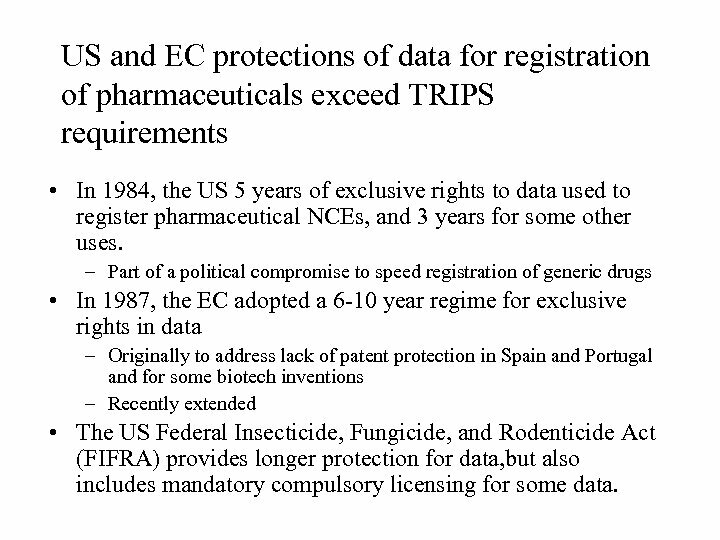 – Part of a political compromise to speed registration of generic drugs • In 1987, the EC adopted a 6 -10 year regime for exclusive rights in data – Originally to address lack of patent protection in Spain and Portugal and for some biotech inventions – Recently extended • The US Federal Insecticide, Fungicide, and Rodenticide Act (FIFRA) provides longer protection for data, but also includes mandatory compulsory licensing for some data. 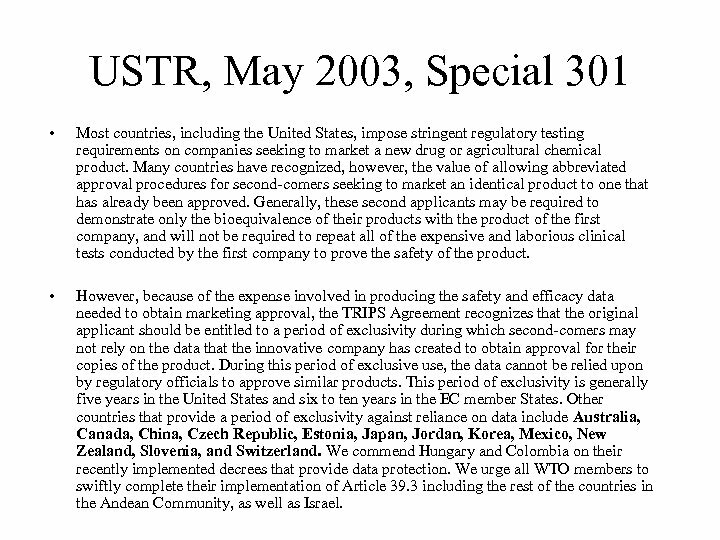 USTR, May 2003, Special 301 • Most countries, including the United States, impose stringent regulatory testing requirements on companies seeking to market a new drug or agricultural chemical product. Many countries have recognized, however, the value of allowing abbreviated approval procedures for second-comers seeking to market an identical product to one that has already been approved. Generally, these second applicants may be required to demonstrate only the bioequivalence of their products with the product of the first company, and will not be required to repeat all of the expensive and laborious clinical tests conducted by the first company to prove the safety of the product. 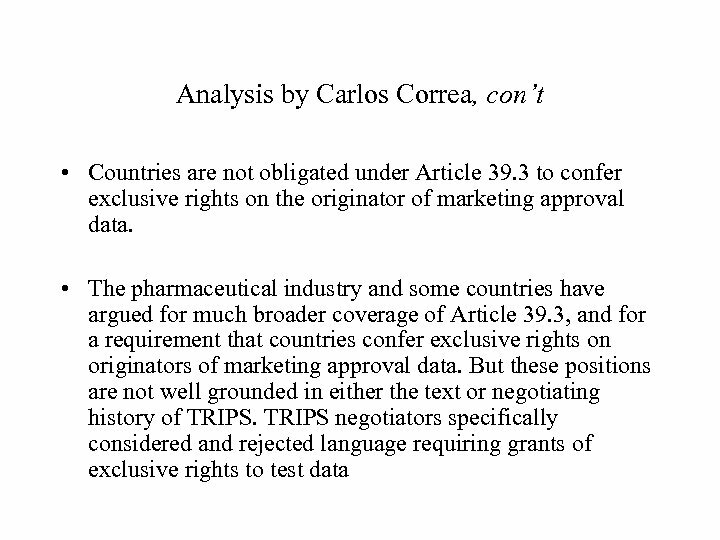 • However, because of the expense involved in producing the safety and efficacy data needed to obtain marketing approval, the TRIPS Agreement recognizes that the original applicant should be entitled to a period of exclusivity during which second-comers may not rely on the data that the innovative company has created to obtain approval for their copies of the product. During this period of exclusive use, the data cannot be relied upon by regulatory officials to approve similar products. This period of exclusivity is generally five years in the United States and six to ten years in the EC member States. Other countries that provide a period of exclusivity against reliance on data include Australia, Canada, China, Czech Republic, Estonia, Japan, Jordan, Korea, Mexico, New Zealand, Slovenia, and Switzerland. We commend Hungary and Colombia on their recently implemented decrees that provide data protection. We urge all WTO members to swiftly complete their implementation of Article 39. 3 including the rest of the countries in the Andean Community, as well as Israel. 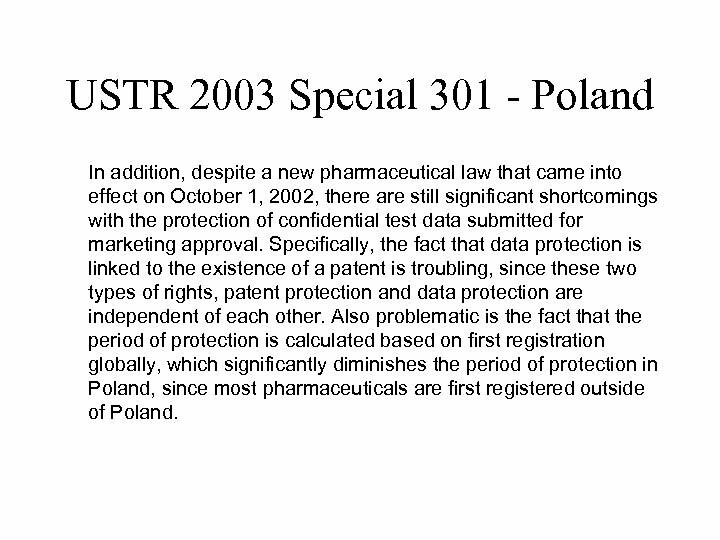 USTR 2003 Special 301 - Poland In addition, despite a new pharmaceutical law that came into effect on October 1, 2002, there are still significant shortcomings with the protection of confidential test data submitted for marketing approval. Specifically, the fact that data protection is linked to the existence of a patent is troubling, since these two types of rights, patent protection and data protection are independent of each other. 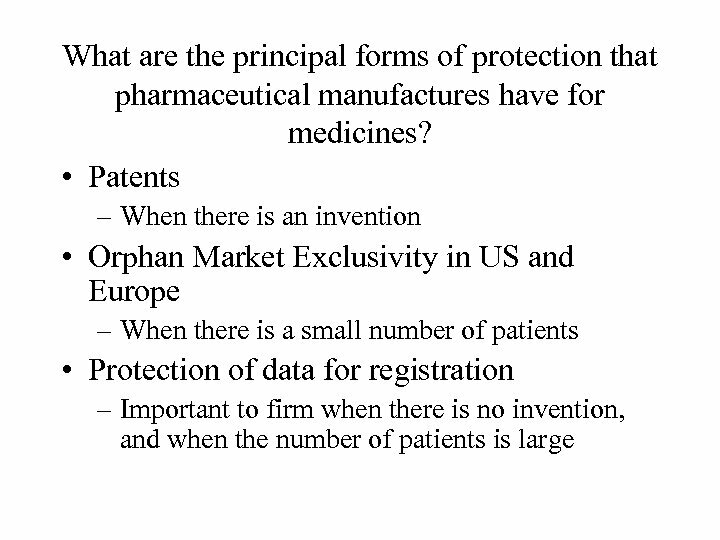 Also problematic is the fact that the period of protection is calculated based on first registration globally, which significantly diminishes the period of protection in Poland, since most pharmaceuticals are first registered outside of Poland. The European Commission has asked several countries to adopt protections that meet or exceed EC requirements EFPMA comment – As part of the Europe Agreements that the various Central and Eastern European Countries have signed with the European Union, the CEE countries are required to provide “a level of protection similar to that existing in the European Union, including comparable means of enforcing such rights. ” – Data protection is a right that should be available now in the Central and Eastern European countries in accordance with the Europe Agreements that have already been signed and which are in effect. In addition, the Central and Eastern European countries are also bound by the TRIPS Agreement and thus Article 39. 3. 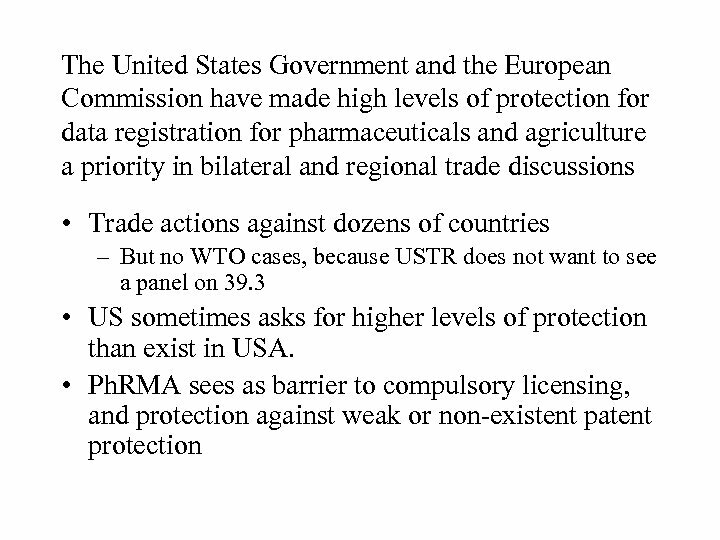 US Trading Partners need to embrace new models of state practice for Article 39. 3 which do not rely upon exclusive rights – CPTech recommends consideration of cost sharing models, similar to US FIFRA approach for agriculture chemicals. – Larger issue is the appropriate protection for investment. • Is the exclusive rights model wrong for areas where there is no creativity or invention? • Do we need to use liability rules for investment based protections? 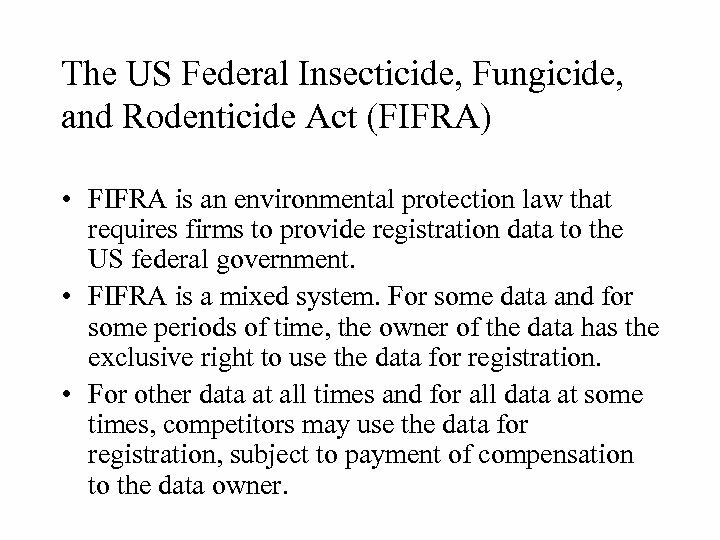 The US Federal Insecticide, Fungicide, and Rodenticide Act (FIFRA) • FIFRA is an environmental protection law that requires firms to provide registration data to the US federal government. • FIFRA is a mixed system. For some data and for some periods of time, the owner of the data has the exclusive right to use the data for registration. • For other data at all times and for all data at some times, competitors may use the data for registration, subject to payment of compensation to the data owner. 7 USC Chapter 6, Subchapter II, § 136 a. 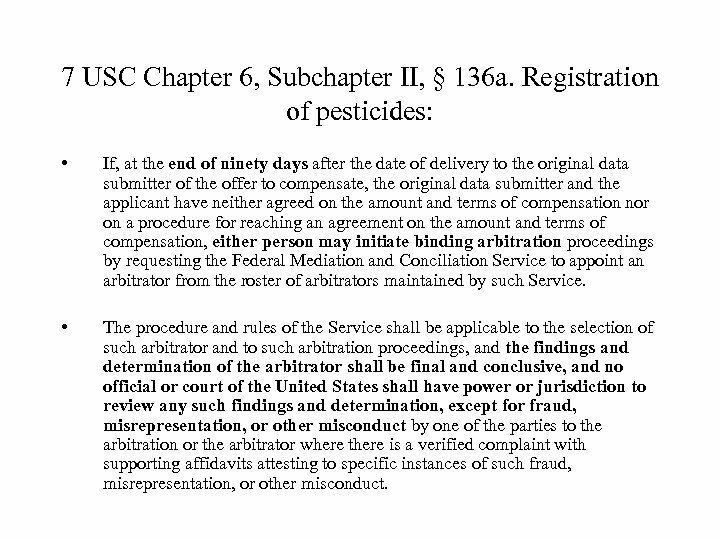 Registration of pesticides: • If, at the end of ninety days after the date of delivery to the original data submitter of the offer to compensate, the original data submitter and the applicant have neither agreed on the amount and terms of compensation nor on a procedure for reaching an agreement on the amount and terms of compensation, either person may initiate binding arbitration proceedings by requesting the Federal Mediation and Conciliation Service to appoint an arbitrator from the roster of arbitrators maintained by such Service. • The procedure and rules of the Service shall be applicable to the selection of such arbitrator and to such arbitration proceedings, and the findings and determination of the arbitrator shall be final and conclusive, and no official or court of the United States shall have power or jurisdiction to review any such findings and determination, except for fraud, misrepresentation, or other misconduct by one of the parties to the arbitration or the arbitrator where there is a verified complaint with supporting affidavits attesting to specific instances of such fraud, misrepresentation, or other misconduct. 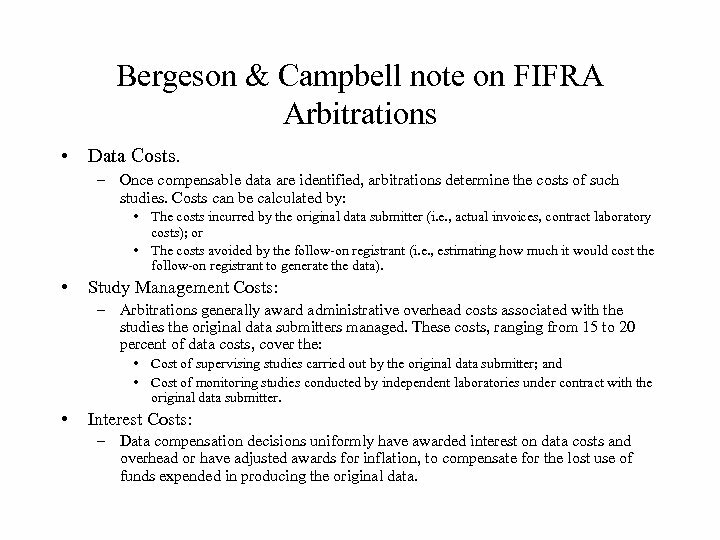 Bergeson & Campbell note on FIFRA Arbitrations • Data Costs. 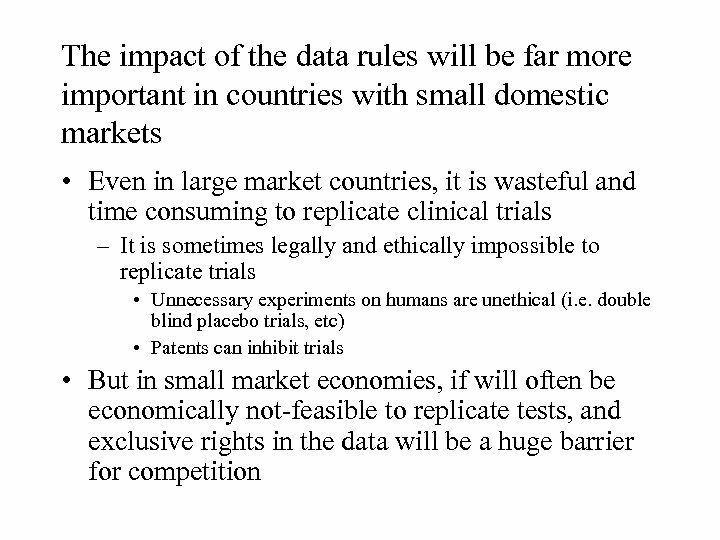 – Once compensable data are identified, arbitrations determine the costs of such studies. Costs can be calculated by: • The costs incurred by the original data submitter (i. e. , actual invoices, contract laboratory costs); or • The costs avoided by the follow-on registrant (i. e. , estimating how much it would cost the follow-on registrant to generate the data). • Study Management Costs: – Arbitrations generally award administrative overhead costs associated with the studies the original data submitters managed. These costs, ranging from 15 to 20 percent of data costs, cover the: • Cost of supervising studies carried out by the original data submitter; and • Cost of monitoring studies conducted by independent laboratories under contract with the original data submitter. • Interest Costs: – Data compensation decisions uniformly have awarded interest on data costs and overhead or have adjusted awards for inflation, to compensate for the lost use of funds expended in producing the original data. 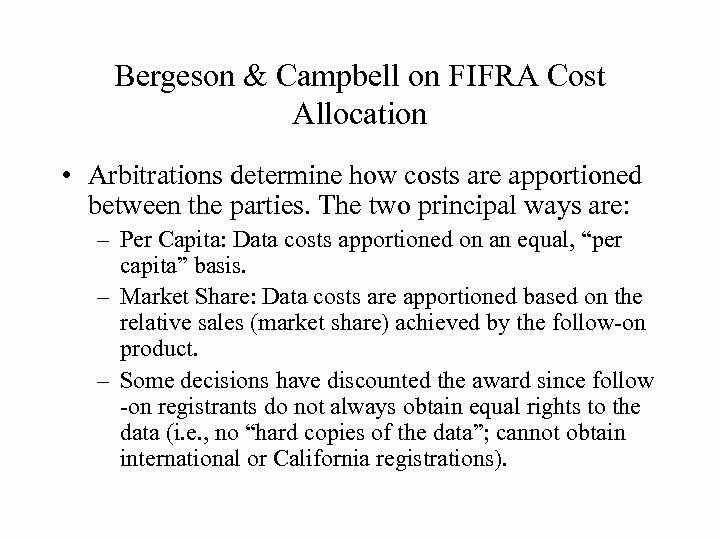 Bergeson & Campbell on FIFRA Cost Allocation • Arbitrations determine how costs are apportioned between the parties. The two principal ways are: – Per Capita: Data costs apportioned on an equal, “per capita” basis. – Market Share: Data costs are apportioned based on the relative sales (market share) achieved by the follow-on product. – Some decisions have discounted the award since follow -on registrants do not always obtain equal rights to the data (i. e. , no “hard copies of the data”; cannot obtain international or California registrations). 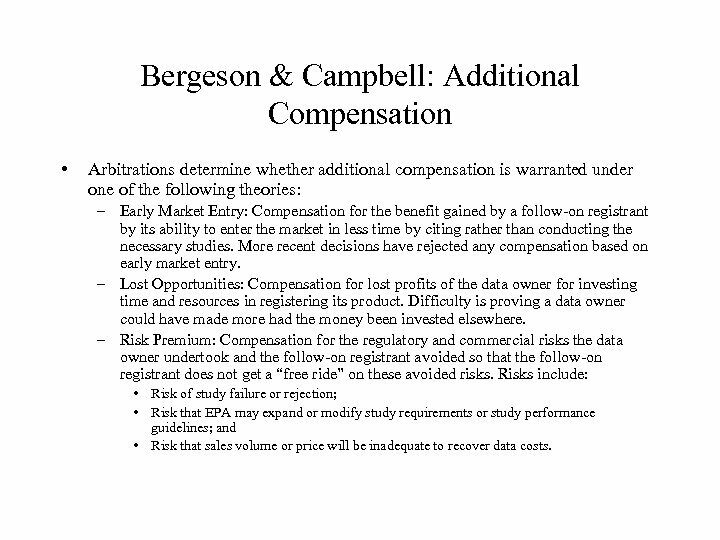 Bergeson & Campbell: Additional Compensation • Arbitrations determine whether additional compensation is warranted under one of the following theories: – Early Market Entry: Compensation for the benefit gained by a follow-on registrant by its ability to enter the market in less time by citing rather than conducting the necessary studies. More recent decisions have rejected any compensation based on early market entry. – Lost Opportunities: Compensation for lost profits of the data owner for investing time and resources in registering its product. Difficulty is proving a data owner could have made more had the money been invested elsewhere. – Risk Premium: Compensation for the regulatory and commercial risks the data owner undertook and the follow-on registrant avoided so that the follow-on registrant does not get a “free ride” on these avoided risks. Risks include: • Risk of study failure or rejection; • Risk that EPA may expand or modify study requirements or study performance guidelines; and • Risk that sales volume or price will be inadequate to recover data costs.